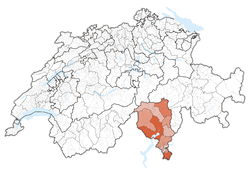 This article is about the Swiss canton. For other uses, see Ticino (disambiguation). 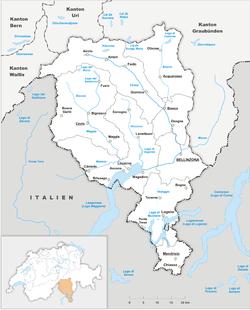 Ticino /tᵻˈtʃiːnoʊ/, formally the Republic and Canton of Ticino (Italian: Canton Ticino [kanˈton tiˈtʃiːno]; German: Tessin [tɛˈsiːn]; French: Tessin [tɛsɛ̃], Romansh: Chantun Tessin [tɕanˈtun teˈsin]; see also in other languages) is the southernmost canton of Switzerland. Ticino borders the Canton of Uri to the north, Valais to the west (through the Novena Pass), Graubünden to the northeast, Italy's regions of Piedmont and Lombardy to the south and it surrounds the small Italian exclave of Campione d'Italia. 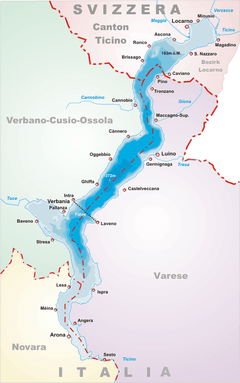 The name Ticino was chosen for the newly established canton in 1803, after the Ticino river which flows through it from the Nufenen Pass to Lake Maggiore. In ancient times, the area of what is today Ticino was settled by the Lepontii, a Celtic tribe. Later, probably around the rule of Augustus, it became part of the Roman Empire. After the fall of the Western Empire, was ruled by the Ostrogoths, the Lombards and the Franks. Around 1100 it was the centre of struggle between the free communes of Milan and Como: in the 14th century it was acquired by the Visconti, Dukes of Milan. In the fifteenth century the Swiss Confederates conquered the valleys south of the Alps in three separate conquests. 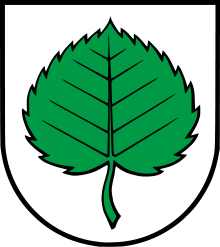 In the early 19th century, the contemporary Franco-Danish scholar Conrad Malte-Brun stated that: “The canton of Tesino [Ticino] is the poorest, and the people the most ignorant of any in Switzerland. 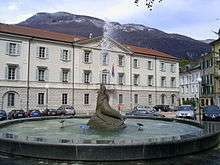 Until 1878 the three largest cities, Bellinzona, Lugano and Locarno, alternated as capital of the canton. 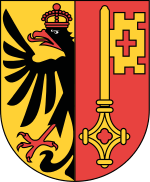 In 1878, however, Bellinzona became the only and permanent capital. The 1870-1891 period saw a surge of political turbulence in Ticino, and the authorities needed the assistance of the federal government to restore order in several instances, in 1870, 1876, 1889 and 1890-1891. The five-member Council of State (Italian: Consiglio di Stato), not to be confused with the federal Council of States, is the executive authority of the canton, and it directs cantonal affairs according to law and the constitution. It is elected in a single constituency using the proportional representation system. Currently, the five members of the Government are: Claudio Zali, Paolo Beltraminelli, Manuele Bertoli, Norman Gobbi and Christian Vitta. Each year, the Council of State nominates its president. The current president of the Council of State is Paolo Beltraminelli. Since a referendum in September 2013, Ticino is the only Swiss canton where wearing full-face veils is illegal. Supporters of the ban cited the case of a 20-year-old Pakistani woman from Bellinzona, who was killed by her husband for refusing to wear a headscarf. 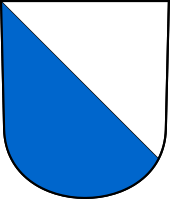 Ticino has a population (as of 31 December 2015) of 351,946. As of 2013, the population included 94,366 foreigners, or about 27.2% of the total population. The largest groups of foreign population were Italians (46.2%), followed by Croats (6.5%) and the Portuguese (5.9%). The population density (in 2005) is 114.6 persons per km2. As of 2000, 83.1% of the population spoke Italian, 8.3% spoke German and 1.7% spoke Serbo-Croatian. The population (as of 2012) is mostly Roman Catholic (70%), further Christian denominations account for 10% of the population (including Swiss Reformed (4%)), 2% are Muslims and 1% of the population has another religion (including Jews (0.1.%)). Italy is by far Ticino's most important foreign trading partner, but there's a huge trade deficit between imports (5 billion CHF) and exports (1.9 billion). By 2013, Germany had become the canton's main export market, receiving 23.1% of the total, compared to 15.8% for Italy and 9.9% for the United States. Many Italian companies relocate to Ticino, either temporarily or permanently, seeking lower taxes and an efficient bureaucracy: just as many Ticinese entrepreneurs doing business in Italy complain of red tape and widespread protectionism. The canton has a higher than average incidence of traffic accidents, recording 16 deaths or serious injuries per 100 million km in the 2004-2006 period, compared to a Swiss average of 6. Gazzosa ticinese, a soft drink available in lemon and a number of other flavours, is one of the most popular beverages from Ticino, and is also common in other regions of Switzerland. It usually comes in flip-top bottles. The estimate for the production of gazzosa in Ticino is 7-8 million bottles a year. Bocce is a folk game that was once a popular pastime locally, but by the early 21st century it was seldom played by younger people. ↑ "Lo scorrere del fiume, l'opera dell'uomo". Azienda elettrica ticinese. Retrieved 28 October 2014. ↑ Roberto Rampoldi (1901). "Intorno all'origine e al significato del nome Ticino". Internet Archive. Retrieved 28 October 2014. 1 2 3 4 5 "Switzerland". Encyclopædia Britannica. 26. 1911. pp. 933–4. Retrieved 2008-10-23. ↑ "The Constitution of Ticino". Ti.ch. Retrieved 2012-01-28. 1 2 3 Federal Department of Statistics (2008). "Regional Statistics for Ticino". Retrieved 2008-11-23. ↑ Jürg Steiner; Manuschak Karnusian; Omar Gisler (28 March 2014). MARCO POLO Reiseführer Tessin. Mair Dumont Marco Polo. p. 23. ISBN 978-3-8297-7172-6. ↑ "Il Canton Ticino si appresta a festeggiare i suoi 200 anni" (in Italian). swissinfo. 2001-08-20. Retrieved 9 July 2009. 1 2 3 4 5 6 "Constitution of the Republic and Canton of Ticino" (in Italian). 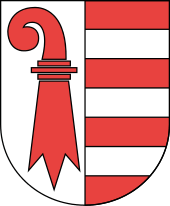 Federal Authorities of the Swiss Confederation. 1997-12-14. Retrieved 9 July 2009. ↑ "Il Consiglio di Stato – Potere esecutivo". ↑ "Elezioni Cantonali 2011". Cantone Ticino. Retrieved 3 November 2014. ↑ "Ripartizione dei seggi per lista". Canton Ticino. Retrieved 4 November 2014. ↑ Nationalratswahlen: Stärke der Parteien nach Kantonen (Schweiz = 100%) (Report). Swiss Federal Statistical Office. 2015. ↑ Squires, Nick. "Burkas and niqabs banned from Swiss canton". Telegraph. Retrieved 2013-10-29. ↑ "Swiss charge Pakistani over 'honour killing' of wife". Daily Times. Retrieved 6 November 2014. ↑ Giorgio Ghiringhell. "Divieto di indossare negli spazi pubblici e nei luo ghi privati aperti al pubblico indumenti che nascondano totalmente o parzialmente il volto (ad esempio il burqa e il niqab)" (PDF). Corriere del Ticino. Retrieved 6 November 2014. 1 2 "Annuario Statistico Ticinese 2015" (PDF) (in Italian). Ufficio di Statistica del Cantone Ticino. Retrieved 4 August 2016. 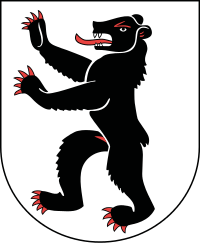 ↑ Bosco/Gurin in German, French and Italian in the online Historical Dictionary of Switzerland. ↑ "Aziende per settore e sezione di attività economica" (PDF) (in Italian). Ufficio di statistica. 2008-01-15. Retrieved 8 July 2009. ↑ "Far Right Party's Ad Campaign Draws Criticism in Switzerland". NYTimes.com. Retrieved 13 November 2014. 1 2 3 "Ticino". United States Commercial Service. 2007-03-14. Archived from the original on 12 October 2008. Retrieved 2008-11-06. ↑ "Disoccupati iscritti e non e tasso di disoccupazione" (PDF) (in Italian). Ufficio di statistica. 2009-07-01. Retrieved 8 July 2009. ↑ "Occupati stranieri e frontalieri" (PDF) (in Italian). Ufficio di statistica. 2009-07-01. Retrieved 8 July 2009. 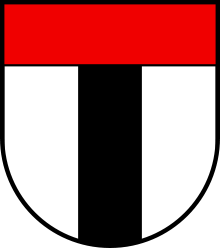 ↑ Frontalieri in German, French and Italian in the online Historical Dictionary of Switzerland. ↑ "Commercio estero" (PDF). Ufficio di statistica. 2009-07-01. Retrieved 8 July 2009. 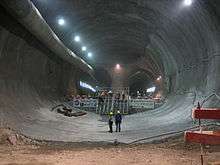 ↑ "Esportazioni secondo il paese di destinazione, dal Ticino, dal 2006". USTAT. Retrieved 6 December 2014. ↑ "Seicento ditte italiane in fuga verso il Ticino" (in Italian). Il caffè. 2009-07-05. Retrieved 8 July 2009. ↑ "In Italia c'è ancora troppa burocrazia" (in Italian). Il Caffè. 2009-07-05. Retrieved 8 July 2009. ↑ "Gold refineries - another Swiss money-spinner". BBC News. Retrieved 13 November 2014. ↑ "La Pamp SA si espande in India". CdT.ch. Retrieved 13 November 2014. ↑ "Die Sonnenstube der Schweiz: "Das Paradies ist hier!"". NZZ.ch. Retrieved 27 November 2014. ↑ "Tessiner Tourismuszahlen: Im Allzeittief". NZZ.ch. Retrieved 27 November 2014. 1 2 "Ticino's warmer climate attracts hikers year-round". The Guardian. Retrieved 5 December 2014. 1 2 Nicola Williams; Damien Simonis; Kerry Walker (2009). Switzerland. Lonely Planet. p. 334. ISBN 978-1-74220-381-2. ↑ "Floral paradise blossoms on Brissago islands". swissinfo.ch. Retrieved 5 December 2014. 1 2 3 "Alp Transit 2016: verso nuovi equilibri territoriali" (PDF) (in Italian). Portal of Canton Ticino. 2006-10-20. Retrieved 8 July 2009. ↑ Hans-Peter Bärtschi: Gotthardbahn in German, French and Italian in the online Historical Dictionary of Switzerland, 2004-07-29. ↑ Gotthard Pass – The traffics from the late 19th century to the present in German, French and Italian in the online Historical Dictionary of Switzerland. ↑ "Tilo: un primo bilancio positivo" (PDF). Portal of Canton Ticino. Retrieved 8 July 2009. ↑ "Regional differences in traffic accidents - bfu-report no. 62 - bfu_2.041.08_bfu-report no. 62 – Regional differences in traffic accidents" (PDF). Bureau de prévention des accidents. p. 71. Retrieved 3 December 2014. ↑ "Airport traffic statistics" (PDF). Airports Council International. 2005-12-06. Retrieved 8 July 2009. 1 2 "Canton Ticino: a taste" (PDF). Swissnews.ch. Retrieved 5 December 2014. ↑ Max Oettli (2011). CultureShock! Switzerland. Marshall Cavendish. p. 189. ISBN 978-981-4435-93-2. ↑ Joanne Lane (2007-07-01). Adventure Guide to Sicily. Hunter Publishing, Inc. p. 165. ISBN 978-1-58843-627-6. ↑ "The Architecture of Ticino "Tendenza" – a case of the past?" (PDF). BTU Cottbus. Retrieved 5 December 2014. ↑ K. Michael Hays (2000). Architecture Theory Since 1968. MIT Press. p. 246. ISBN 978-0-262-58188-2. ↑ "Tessiner Polenta". TicinoTopTen. Retrieved 27 November 2014. ↑ "What is a Boccalino?". Boccalino Grotto. Retrieved 27 November 2014. ↑ "Gazosa – die Kultlimonade aus dem Tessin". Schweizer Radio und Fernsehen. Retrieved 26 November 2014. ↑ "La gazzosa ticinese sfonda il Gottardo" (PDF). Il Caffè. Retrieved 26 November 2014. ↑ "Boccia - vom Zeitvertreib zum Leistungssport: Kommen die Kugelschieber zu olympischen Ehren?". NZZ.ch. Retrieved 27 November 2014. ↑ "Presse: les titres participants" (PDF). REMP. Retrieved 3 December 2014. ↑ "REMP bulletin des tirages 2014" (PDF). REMP. Retrieved 3 December 2014.